By nature, rabbits choose one or a few places (usually corners) to deposit their urine and most of their pills. Urine-training involves little more than putting a litter box where the rabbit chooses to go. Pill training requires only that you give them a place they know will not be invaded by others. Here are some suggestions to help you to train your rabbit to use the litter box. 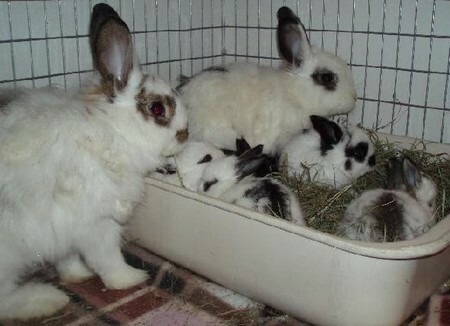 Initially, keep rabbit confined to cage with a litter box. Observe to make sure your rabbit is using the box. If rabbit seems to prefer another area of cage, move litter box there. Once your rabbit is using a box in the cage, let out of cage in a limited space, under close supervision. Place a second litter box outside of the cage in this space. Make the litter box enticing with a favorite toy or treat. If you notice the rabbit backing up with its tail up, gently herd him/her to litter box. Whenever your rabbit uses the litter box, make sure he/she gets lots of praise and possibly a favorite treat. Never punish a rabbit for mistakes. Gently steer to litter box if caught in the act, but this must be immediate to have any effect. Once your rabbit is using the box outside of the cage, gradually increase the space the rabbit can roam in. Add more litter boxes as necessary as the rabbit probably won’t go too far in search of a box. Be flexible about placement of boxes – if rabbit seems to prefer a particular place as a toilet, put a box there. If your rabbit wants to use an inconvenient location, place a box there and gradually move it out of the way. If your rabbit begins having accidents, backtrack to the confinement and limited space with supervision stage and begin again. You can use a plastic Rubbermaid tub that is shallow enough for your rabbit to hop in and out of it or a metal litter box from KW Cages. If you use the plastic tub, you will need to use shredded newspaper, hay, or Carefree cat litter. Other litters contain too much dust, which can cause pneumonia in your rabbit’s delicate upper respiratory tract, which can be fatal. In the rubber tub, your rabbit will sit in the litter box on whatever puddles and pebbles he leaves. The KW Cages litter box contains a removable metal mesh floor, so your rabbit’s paws and bottom will remain clean.